How to debug a mapping? I see a lot of questions on here where a user has a mapping which doesn't work and most of the time the reasons are pretty similar. I suggest to make this question a reference for this kind of questions, to give a complete procedure to debug a mapping. If a user as a problem with a mapping they could be redirected here to eliminate the most common issues. Of course there will still be particular cases which will require a dedicated question and will not be addressed here. When asking for help about a mapping it is a good thing to add this information since it can help other people to understand the behavior of your mapping. It is possible to restrict the prompt to a particular mode with the sister-commands of :map, like :vmap, :nmap, :omap, etc. Note that the <Leader> key will be replaced by its actual value in the list. If the result of the command shows that your keys are not correctly mapped see the following part. Another convenient use of the :map command is to combine it with verbose: This will prompt the last file which modified your mapping. If the last file which changed your mapping is your .vimrc, make sure there is no other line that also defines a mapping for the same key. The .vimrc file will happily override any mappings with the last one of its kind in the file. The command :map shows that your key is correctly mapped but pressing it does nothing. Your mapping works on a defined OS but not another one. Refer to the doc of your terminal or of your desktop environment. If this is the problem, you then have two solutions: either you spend (a lot of) time to change the behavior of the application which causes the problem or you find another key combination to map which isn't intercepted by another application. Your terminal emulator can't handle the key combination you're trying to map: Terminal emulators are implemented differently and some of them are not able to handle some particular key combination. (The reason why they can't is out of the scope of this question, see their doc or the sister-sites mentioned before for more details). In this case, you don't have a lot of solutions: either you change your key for another one which is handled properly by your terminal or you change your terminal emulator. Vim will consider the whitespaces, the " and the comment as a part of the mapping which will result in an unexpected behavior. This is easier to read and won't mess your mapping. Vim will consider the pipe | as a command termination: When you source your .vimrc the mapping nnoremap <Leader>x :w will be created then the external command !% python -m json.tools will be executed. See an explanation about <bar>. Know when to use nore: always. When you'll hit > your line will be deleted, that's good. But when you'll hit - your line will also be deleted instead of being indented. Why? Because Vim understood "I received a hit on - which I should translate to > which I should, in turn, translate to dd". This way Vim will translate - as > and will not try to do any other translation because of the nore. Use a recursive mapping only if you intend to use any other mapping in your mapping. Use non-recursive mappings if you don't. On French keyboards <M-a> is the same as á and the same goes with all the <m- mappings. 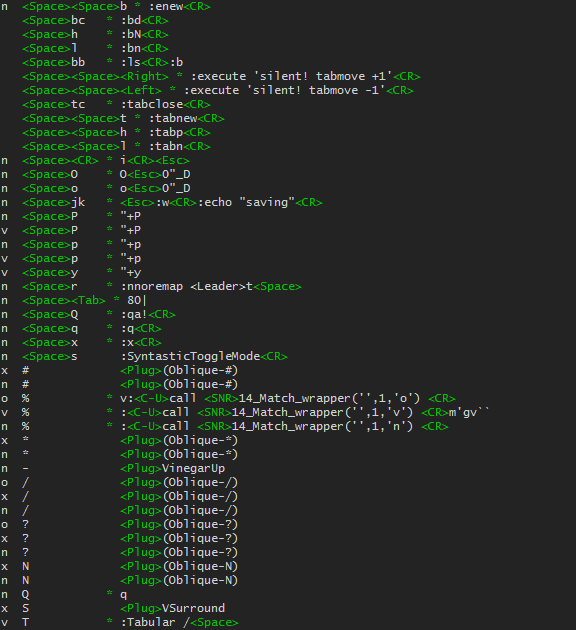 As @LucHermitte pointed out in the comment that is a problem with plugins using this type of mappings like vim-latex. <C-S-a> is equivalent to <C-a>. Mapping Ctrl+upper case letter separately from Ctrl+lower case letter is not possible cause of the way the terminals send ASCII codes. When your mapping seems to affect another key try to use another lhs combination, if that solves the problem inspect which hexadecimal codes are sent to Vim. Check that your leader is correctly defined: If your mappings involving <leader> doesn't work and you changed your leader with the command mapleader, check that the definition of your leader is done before the definition of the mappings. Otherwise, Vim will try to create mappings with a key which is not the one you think. Also if you want to use the space bar as your leader (which is pretty current) make sure that you used the correct notation: let mapleader = "\<Space>"
Your mapping still doesn't work? If you went through all the steps of this answer and your mapping still doesn't work like you want, you'll probably want to ask for help on this site. The command you used to define your mapping. What you are expecting your mapping to do. "It doesn't work" won't be really helpful to people who will try to help you. You should precise if the mapping doesn't do anything or how it behaves differently than what you were expecting. All of this will save you and the users of the site a lot of time. Sometimes it can be useful to reset a mapping without quitting Vim to help debugging its behavior. To do so you can use the command :unmap <key> which will remove the mapping assigned to <key> for Normal, Visual and Operating-pending modes. :iunmap will remove mappings for Insert mode. For other modes see :help :unmap. How can I detect which command triggers a shortcut in a third-party package? Can I map a Ctrl + upper-case letter separately from Ctrl + lower-case letter? Why does remapping <Esc> make the cursor jump? What does asterisk mean in vim mappings? How to execute <leader>pcd mapping?